This is one of the better photos I have seen on the internet. I really hope it's not a hoax. There are actually two ghosts, look at the top left balcony and the bottom left balcony. We honeymooned in Eureka Springs, we are from Indiana. 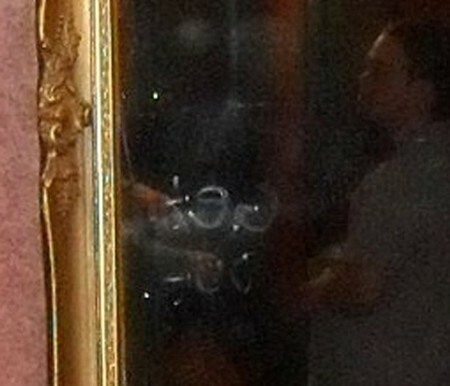 Strange apparition appeared in a photo my husband took while we were on the ghost tour at the Crescent Hotel. Looks like a baby in someone's arms and a finger writing 'get out'. The words look backwards like it was writing from within the mirror. Brought tears to my eyes when I noticed it. So strange. Not sure if this is related but the next morning we received a call that my dad had become sick and we found our cat mysteriously shot when we returned home. Wow. 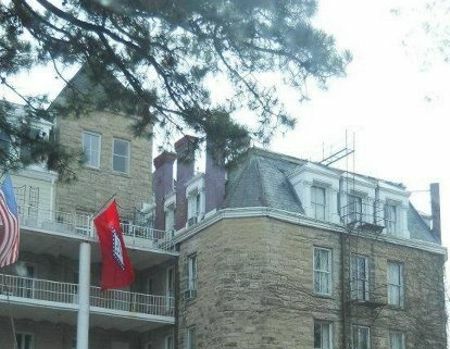 Just got back from ES after visiting the Crescent Hotel. For 'fun' my wife and I shot several pictures from hallways and stairwell. In one clear stairwell picture a large dark fuzzy bundled figure appeared on a floor below and clearly looks like he is carrying a baby in white. Now at home we were searching to see if any previous sightings were seen of someone carrying a baby. Chills when we read your post. PS - I became quite ill with a bad chest cold the very next day, so we came straight home to Illinois. But still very curious about this sighting. Will post pic soon.